(Friday) General English 9.00 A.M. to 12.00 Noon. 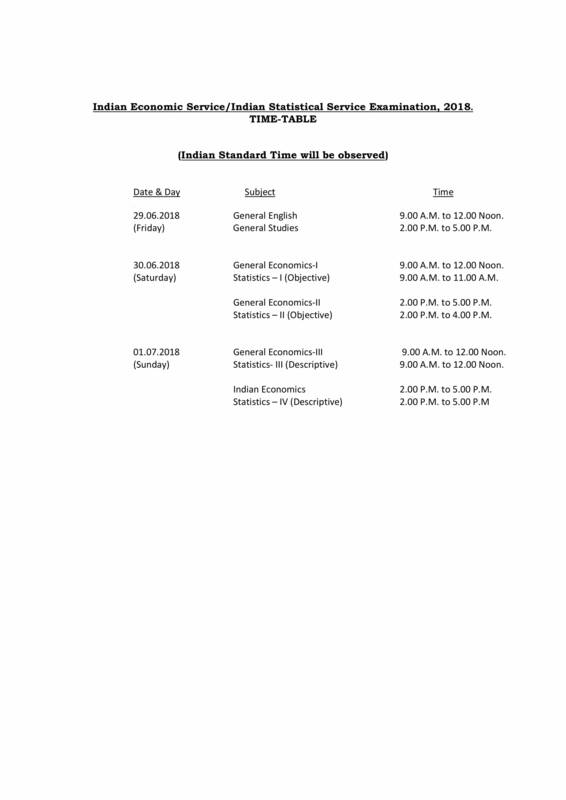 General Studies 2.00 P.M. to 5.00 P.M.
(Saturday) General Economics-I 9.00 A.M. to 12.00 Noon. Statistics – I (Objective) 9.00 A.M. to 11.00 A.M.
General Economics-II 2.00 P.M. to 5.00 P.M.
Statistics – II (Objective) 2.00 P.M. to 4.00 P.M.
(Sunday) General Economics-III 9.00 A.M. to 12.00 Noon. Statistics- III (Descriptive) 9.00 A.M. to 12.00 Noon. Indian Economics 2.00 P.M. to 5.00 P.M.